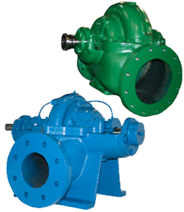 Split-Case Centrifugal Pumps are available in both Horizontal and Vertical Configurations. These units are designed for higher flows and higher heads than can be developed with a straight centrifugal pump. The horizontally split casing allows for easy maintenance. The impeller on this units is hydraulically balanced and is mounted between the bearings eliminating the overhung load of an end suction centrifugal, providing limited shaft deflection and longer bearing life. Use for the following applications: General Water Service, Booster Service, Municipal Water Supply, Air Scrubbers, Condenser Water, General Industrial Services such as Continuous Caster Mold Water Pumps, Spray Water Pumps, Machine Cooling Water Pumps, Filter Feed and Backwash Pumps, and Cooling Tower Service. Available From Theses Manufactures: Crane Deming Pump – Weinman Pump Co.